Looking much like a low-rider-in-waiting, the 224 inch (18.7 foot) long LTD two-door represented Ford’s top-of-the-line full-sized luxury coupe, a proper celebration of American excess during the nation’s Bicentennial year. Rest assured it will be the only one parked at work or the mall. 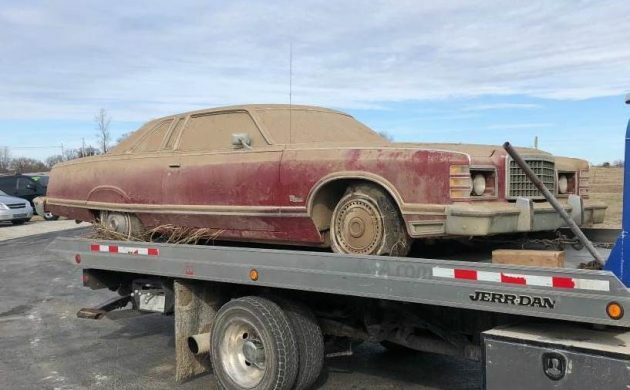 This particular 1976 Ford LTD in Clinton, Missouri seeks a new owner here on craigslist in Kansas City, Missouri where a mere $950 will land you a swell, if not downright swollen, project car. Thanks to reader Michael A. for spotting this once-impressive prairie schooner. While many two-door vehicles feature a shorter wheelbase and overall length than their companion four-doors, Ford chose to simplify manufacture by giving both coupe and sedan the same wheelbase and length. This one features the rare “Smashaway Rear Window” for increased ventilation. While this is a literal barn find, potential buyers should carefully inspect the lower regions for water damage as some barns are more watertight than others. This interior may well clean up well, and appears to feature power seats. This two-door can accommodate up to six adult passengers, and carry them down the road in comfort and style. Want to impress your buddies at the country club? A restored LTD may turn more heads than the latest techno-swaddled luxo-shuttle. Equipped with the standard 351 cid V8, the LTD might have been upgraded with 400 or 460 cid options. 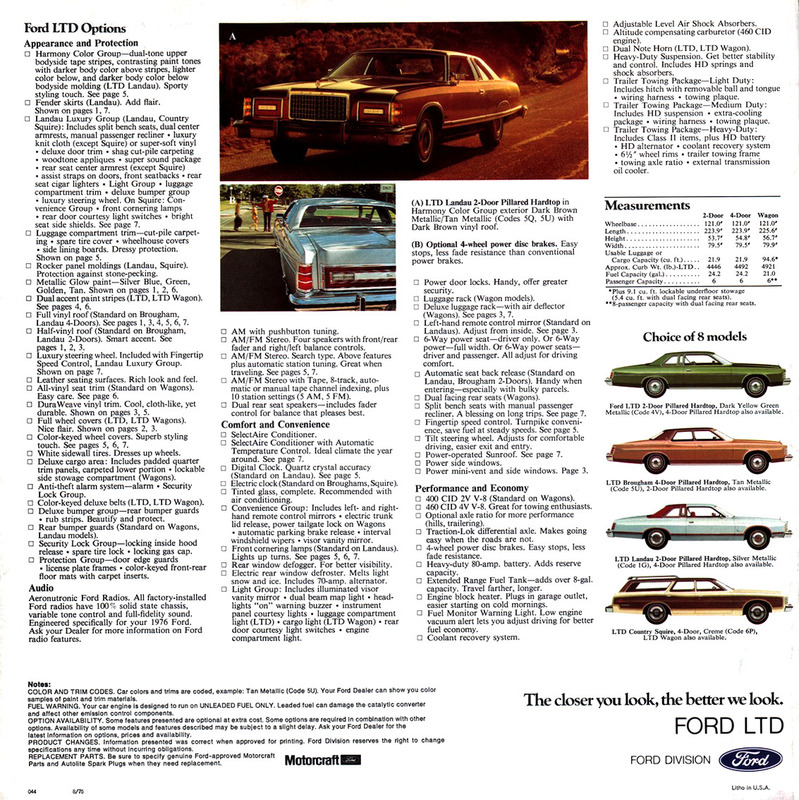 Ford sales literature called the latter option “Great for towing enthusiasts.” Ford also offered optional four-wheel disc brakes to help bring the LTD’s 4300 lb bulk under control. While this may seem extreme, it’s only 100 lb more than the 2019 Dodge Challenger R/T, and 1200 more than a Prius, a car that might fit tidily in the LTD’s trunk. 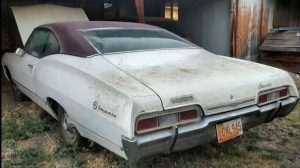 The investment potential of a ’76 LTD may pale compared to a high-powered and sporty Mustang but, at $950, it might become a nice driver that will stand out in a sea of perfect pony cars. To what destination would you pilot this burgundy barge? You’ve got to want one of these badly to be willing to take on a project like this. No telling what’s under that dirt. Seller probably got it for free after the barn fell down around it. Get the hay baler out for this one. Who knows, it might shine with some work. Looks like a recent broken backglass, maybe keys locked inside? “Smashaway Rear Window”. Great line Todd!!!!!! I’m guessing that the doors couldn’t be opened as a result of whatever was next to ’em was too darned heavy to move, hence the Smashaway window. That said, now who among us, stateside, is going to step up and save the whale..? At least it is a beached whale. A side door window woukd have been a less expensive entry and I wiuld think someone would be able to use a slim Jim on that year of car with no issues. Love this land barge. It’s longer than the flatbed! I have a 76 station wagon powered by the 460. I bought the car for the engine and driveline, but there is no question these look, handle, and feel like large barges (or land yachts). I can’t find anything exciting about the design, but the value is certainly there as a parts, or special purpose car. 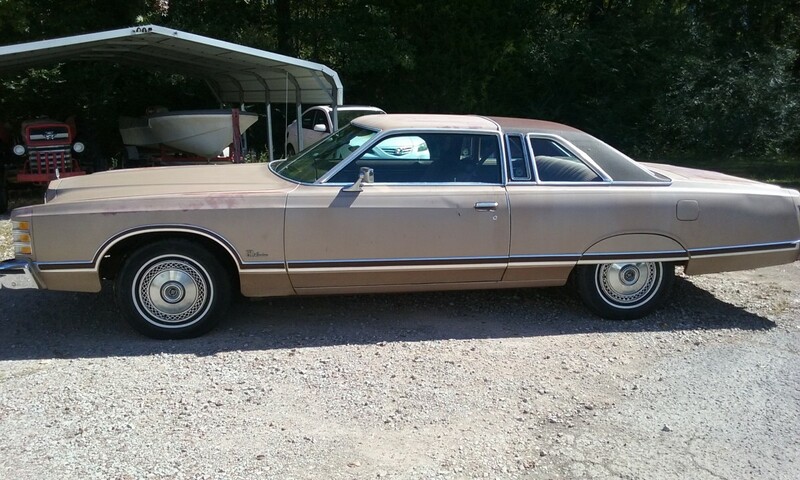 I drove a 1975 LTD in high school and it was one of the best cars I have ever owned.I wouldn’t mind having this one,but I would probably be better to find one that all it needs is a new home. Oh boy, it is badly in need of a bath! I like it tho. I had one back in the day, in triple black. And with a 400- 4bbl, and dual exhaust, she would really move. I just mentioned (in the ’72 Chevelle post) how I used it one night to catch a thief who stole my brother’s mint condition 1972 Chevelle. What a night that was. It had such a sinister appearance, too. 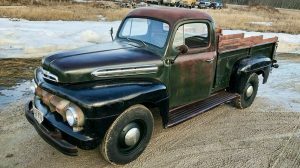 In all black, with the hideaway headlamps and fender skirts in place, it reminded me of a 50’s lead-sled. Good memories! I’m with you Todd. Looking at the watermark on the right front wheel, and the debris in the door sill, floor and back seat, I would say that this big ol’ girl was under water at some point. The less desirable cars from the ’70s are becoming collectible; they’re affordable and relatively plentiful. The Camaros, Firebirds and Mustangs from the 1970s are already showing up at your local car shows and cruise nights. This one is 43 years-old, it’s a two door, apparently nicely optioned and it’s unusual; all pluses in the hobby. For less than a grand, it could be a fun car to tinker with. 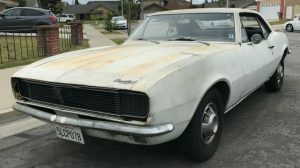 Might not cost too much to get it roadworthy and presentable. If you can’t get it roadworthy, part it out. I would enjoy pulling into my local show and shine with this vintage LTD, it would get a lot of attention and be the only ’76 LTD there. I attend a Cruise ‘Nite here in Connecticut that always has 400-500 cars show up every Monday; it’s huge. More and more cars from the 1970s and even the 1980s are being resurrected and show up there. Guys like the cars they had or wished they had when they were kids. The generation after the ’50s and ’60s car guys are going with the later cars, the ones they grew up with. It might be time to pick up a clean, low-mileage 1980s or 1990s car and stash it away for a few years. Could turn into a nice retirement bonanza down the road. My thoughts are similar to Fordguy1972’s. These sorts of cars aren’t going to be valuable, but they can be fun to own and/or show at the local cruise-in. You would get the typical “my (dad, aunt, neighbor, math teacher, ….) had one; haven’t seen one in years!” comments, which are great conversation starters. Sure would be nice to see this one cleaned up. It may not be too bad. The necessary work would be a labor of love…. but aren’t they all? My friend’s mother ( Hi, Mrs. Logan!) had a four-door version of this with ALL the options. I’ve long since lost track of just how many of us fit into it, but I’ll never forget the glorious seventies greenness of it all. Bag it, put some duals and wheels on it, and you’ve got a nice cruiser. While it may never be worth much, it would certainly be fun to tinker with. Imagine having having a car you could customize to your taste that no one would complain about because it’s not valuable. The choices are almost unlimited! If the motor stayed dry, its probably not as bad as it looks. Shame someone didn’t understand the whole point of storing a car in a barn to begin with. Guess this would check off something on my bucket list: I’ve always wanted to power wash the INSIDE of a car. Love these land yachts. And they will start bringing decent money soon. I have a 77 Ltd coupe with 51000 miles on it.and a 78 grand marquis and I love driving them. These are already bringing decent money. I don’t know why it keeps getting posted here that this car has no value. Prices are going up on all of these big old cars. Here is a tidbit of information. 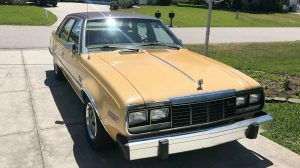 The 1976 Ford LTD that was sold in Mexico with a 351 V8 had 250 HP while the same car sold in the US with the same engine had 149 HP. That 100 HP makes all the difference in the world on this car. I think the problem is ‘decent money’ is a relative term. A lot of people think that is $10-$20 thousand. How do you make a small fortune in old cars?… Start with a large one. Thank God the owner did wash or more accurately scrape all the dirt off the car. I could see it now just spray the car with a couple coats of heavy clear and you instantly have that fine patina! Concerning cars that have been “compromised” in less-than-ideal long-term storage: what about the smell? I tend not to consider that when looking at photographs. But when at a well-known classic car auction several years ago, there was a fleet of 70s luxury cars offered in “driver” condition. Thinking they might be bargains, I checked them out on the lot pre-auction. When I opened doors, at each car I was bombarded by that musty/moldy/mildew/wet dog smell that nearly bowled me over. Each of these cars, from the same owner, had been stored in damp conditions. There’s no way i could tolerate a car that smelled this way, regardless of price. The visual condition of the interiors was good, and did not call restoration or replacement. The question: CAN one successfully rid a car of similar smells, short of replacing every single piece of soft trim, and maybe more? That’s a particularly expensive endeavor! Yes, you can use an ozone generator to remove odors. A good friend had a Model A Ford with a leaking roof. He used an ozone generator to take out the mildew smell. Ozone generator….never thought of that. I had one in my house once, gave me a terrible headache. But it would be a perfect solution for a closed car. Wonder how long it would take to remove the smell? On a similar note, maybe a dehumidifier could be used first if moisture is present? Thanks for your suggestion!